1. What wind direction works? By this we mean finding out if your local spot is best windsurfed in an onshore, cross shore or offshore direction. Typically a cross shore to cross onshore wind works well in most situations as you get a nice clean wind and can windsurf out and back from your launch site. If you get into trouble the worst case scenario is that you drift sideways or slightly in to the launch site but not out into deeper water. Onshore winds are ok as they push you back into your launch site but often create difficulties trying to get out as you are fighting against the wind, having to tack your way out. Onshore winds can also create choppy water when the wind really picks up! Offshore winds are generally a no go when sailing from the beach, mainly because if your equipment breaks you are only going to be taken one way and that’s out to sea! In a protected environment an offshore wind can work and does have its advantages. For example, in the protected bay at Poole Harbour there is standing depth a fair way out so even if you drift a little in an offshore wind you can just walk your equipment back upwind into shallow water and start again. Offshore winds also create very, very flat water which makes balancing much easier for those taking beginners windsurf lessons or practicing their improver windsurf skills. Also, windsurfing close to the launch site in an offshore wind can shelter those learning how to windsurf on days where ordinarily a strong wind forecast would prevent them from going out. We are not promoting that you should rush out to go windsurfing in an offshore wind but in the right location and under supervision there are times when they can be at least considered. 2. How to read the weather forecast? Before you pack up and drive to your local windsurf spot make sure you have looked at what the wind is actually doing! 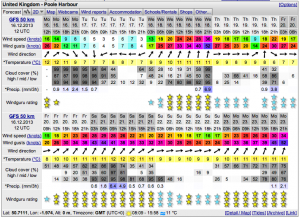 Reading the wind & weather forecast is all part of choosing a windsurf location in the UK. 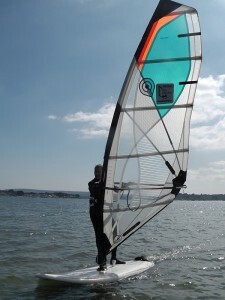 For our local spot we have made the Ultimate Wind And Weather Forecast For Poole Harbour where you can learn how to read the forecast and get links through to all the top sites predicting the weather in relation to windsurfing. A top tip is to use several forecasting sites to make a comparison and come to your own conclusion as to what the consensus is regarding the predicted wind strength and direction. In this way you also begin to learn which forecasting sites over estimate and which ones under estimate the wind strength. The aim here is to give you the inside line when choosing a windsurf location in the UK. 3. Where should you rig up? So, you have chosen a great windsurf location in the UK, checked the forecast is suitable and raced there to get out windsurfing! Make sure you have read our post giving 10 Top Tips For Rigging A Windsurf Sail and another all about How To Rig Your Windsurf Sail Correctly so that setting up goes smoothly. You want to choose a good spot to rig up your windsurf kit. Rigging on a nice open grassy area would be ideal as it is nice and soft, which is great for stopping any wear and tear as you are rigging up. In reality you often end up rigging on the carpark concrete which is ok, just be careful placing down your board & when rigging your windsurf sail make sure you don’t drag it around as tarmac is pretty abrasive stuff! Well, the best spot for windsurfing is a location that draws on all the good points mentioned above along with other factors that will accelerate your learning and give you maximum enjoyment from your windsurfing. We feel that our teaching location at Poole Harbour really has everything you could want to make the perfect windsurf location in the UK. It works in any direction, has space for rigging, free parking (if you know where – just ask us 😉 and a large designated area of protected shallow water especially for windsurfing. For beginners the protected bay offers the clean winds & excitement of open sea windsurfing but with the safety of shallow water. Learning how to windsurf is so much easier when you are not wasting valuable energy swimming for the board and having to heave yourself back onto it every time you fall in! For intermediate windsurfers, you can practice valuable skills such as beach starting, choosing exactly what depth to attempt them at. Start out with knee deep to get the technique then move out a few metres to try them at waist deep and even further to master the beach start at chest deep. For advanced windsurfers looking to crack the carve gybe or learn how to waterstart our teaching location at Poole Harbour gives you the opportunity to try over and over without the fear of being out of your depth! You can pause for thought after every carve gybe attempt or slowly drift back into standing depth if you get tired trying your waterstarts. Choosing a windsurf location in the UK is easy when you have a checklist such as this!